The body of the leviathan, especially his eyes, possesses great illuminating power. This was the opinion of R. Eliezer, who, in the course of a voyage in company with R. Joshua, explained to the latter, when frightened by the sudden appearance of a brilliant light, that it probably proceeded from the eyes of the leviathan. He referred his companion to the words of Job xli. 18: "By his neesings a light doth shine, and his eyes are like the eyelids of the morning" (B. B. l.c.). However, in spite of his supernatural strength, the leviathan is afraid of a small worm called "kilbit" ( ), which clings to the gills of large fishes and kills them (Shab. 77b). The leviathan is prominent in the haggadic literature in connection with the advent of the Messiah. Referring to Job xl. 30 (Hebr. ), "and the pious ones [ ] shall make a banquet of it," R. Johanan says that at the time of the resurrection a banquet will be given by God to the righteous, at which the flesh of the leviathan will be served (B. B. l.c.). Even the hunting of the leviathan will be a source of great enjoyment to the righteous. Those, says R. Judan bar Simon, who have not taken part in pagan sports will be allowed to participate in the hunting of the leviathan and of the behemoth (Lev. R. xiii. 3). Gabriel will be charged with the killing of the monster; but he will not be able to accomplish his task without the help of God, who will divide the monster with His sword. According to another haggadah, when Gabriel fails, God will order the leviathan to engage in a battle with the ox of the mountain ("shor habar"), which will result in death to both of them (B. B. 75a; Pesiḳ. p. 188b). Not only will the flesh of the leviathan furnish food for the table of the righteous, but there will be a great supply of it in the markets of Jerusalem (B. B. l.c.). From the hide of the leviathan God will make tents for the pious of the first rank, girdles for those of the second, chains for those of the third, and necklaces for those of the fourth. The remainder of the hide will be spread on the walls of Jerusalem; and the whole world will be illuminated by its brightness (ib.). These haggadot concerning the leviathan are interpreted as allegories by all the commentators with the exception of some ultraconservatives like Baḥya ben Asher ("Shulḥan Arba'," ch. iv., p. 9, col. 3). According to Maimonides, the banquet is an allusion to the spiritual enjoyment of the intellect (commentary on Sanh. i.). The name, he says, is derived from (" to join," "to unite"), and designates an imaginary monster in which are combined the most various animals ("Moreh," iii., ch. xxiii.). 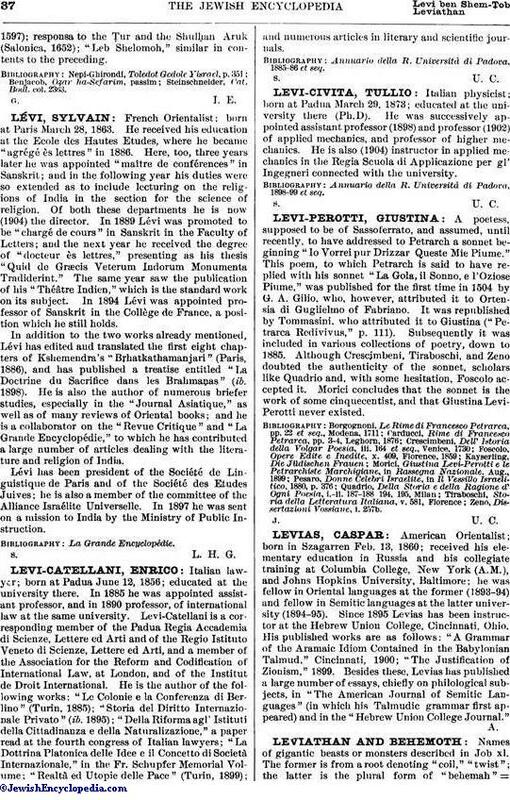 In the cabalistic literature the "piercing leviathan" and the "crooked leviathan" (Isa. xxvii. 1), upon which the haggadah concerning the hunting of the animal is based, are interpreted as referring to Satan-Samael and his spouse Lilith ("'Emeḳ ha-Melek," p. 130a), while Ḳimḥi, Abravanel, and others consider the expressions to be allusions to the destruction of the powers which are hostile to the Jews (comp. 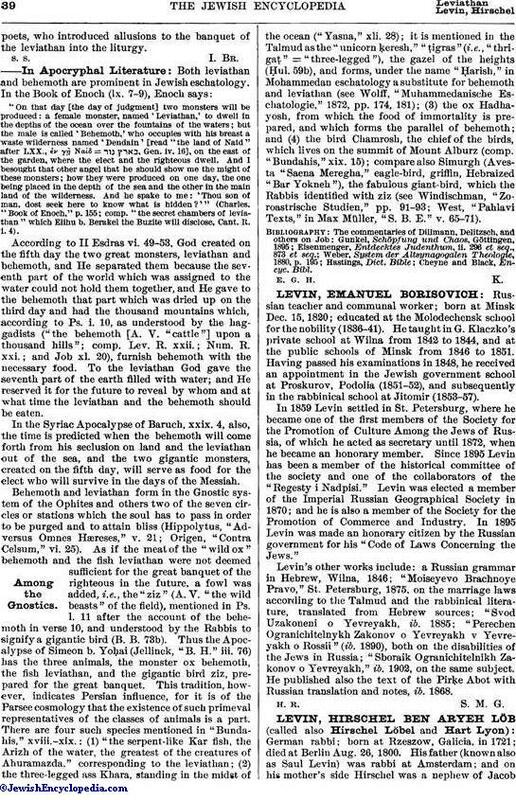 Manasseh ben Israel, "Nishmat Ḥayyim," p. 48; see also Kohut, "Aruch Completum," s. v. "Leviathan," for other references, and his essay in "Z. D. M. G." vol. xxi., p. 590, for the parallels in Persian literature). The haggadic sayings obtained a hold on the imagination of thepoets, who introduced allusions to the banquet of the leviathan into the liturgy. 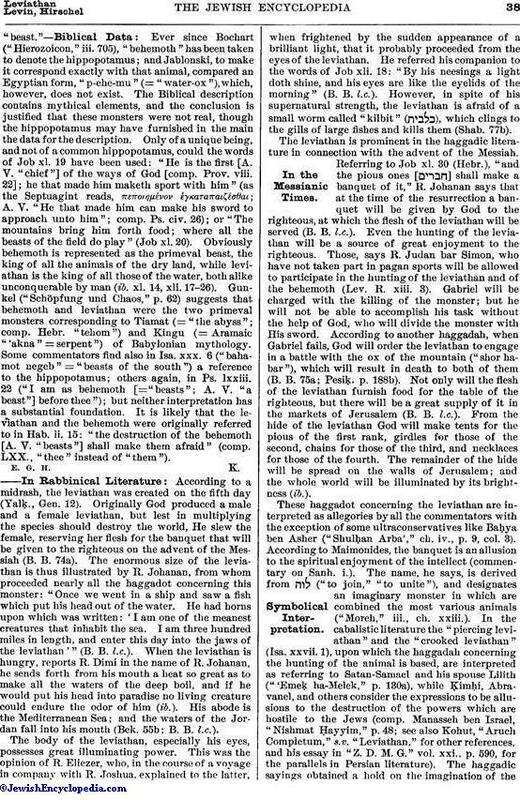 "On that day [the day of judgment] two monsters will be produced: a female monster, named 'Leviathan,' to dwell in the depths of the ocean over the fountains of the waters; but the male is called 'Behemoth,' who occupies with his breast a waste wilderness named 'Dendain' [read "the land of Naid" after LXX., ἐν γη Ναίδ = , Gen. iv. 16], on the east of the garden, where the elect and the righteous dwell. And I besought that other angel that he should show me the might of these monsters; how they were produced on one day, the one being placed in the depth of the sea and the other in the main land of the wilderness. And he spake to me: 'Thou son of man, dost seek here to know what is hidden?'"